Edgar Charles Raithby was the fourth son of Charles and Ellen Raithby, was born on 22 July 1894 in Bottesford. Charles Raithby was born in 1853 at Strubby in Lincolnshire and Ellen Rathby was born at Colsterworth in 1859. The couple married at Spilsby in 1880. Charles and Ellen prospered. When Edgar was born, the family lived at Scrimshaw’s Mill, Bottesford by the Grantham Canal where Charles Raithby worked as the miller and baker. By 1901 the family had grown to include 9 children including Thomas (18) who is not recorded as living at home. The other 8 children lived with their parents at the Mill – Nellie (19), Frank (17), Ernest (14) Bertha (12), Mabel (10), Elsie (7), Edgar (6) and Evelyn (4). Frank was a miller’s apprentice assisting his father. Edgar was at school. In the census of 1911 Edgar (16) was recorded as working at the mill. However by then his older brother Frank had had emigrated to Canada in 1910. We have yet to trace Thomas’s and Ernest’s war service. However both Frank and Edgar were in the armed forces. Sadly the Raithby family would suffer the loss of two sons. Edgar, the youngest son was killed in action in October 1917. Close to the anniversary of his death one year later Frank died of wounds. Frank had returned to the UK from Canada to serve in the 3rd Battalion of the Canadian Expeditionary Force. He saw extensive service before injury in October 1918 shortly after distinguishing himself at the Battle of Bourlon Wood. He received the DCM for his bravery. Further details can be found in his Service Biography. Edgar Raithby attested in Leicester on the 7th December 1915. He then returned home until he was assigned to the Army Reserve on 9th February 1916 and then on to the 3rd Battalion the Leicestershire Regiment on 16th February 1916 as part of the Humber Garrison for training. On completion of his initial training he was transferred to the Loyal North Lancashire Regiment on 11 July 1916 and posted to active service on 19th August 1916. He sailed from Devonport on that day and arrived in German East Africa on 29 September 1916. Edgar’s records show that he ‘embarked for Egypt’. No date is given but according to Harry Fecitt’s account this would have been at the end of December 1916 aboard the transport Elele via Aden bound for Egypt. By February 1917 the Battalion although at fighting strength with 20 officers and 802 other ranks, 2 Officers and 293 other ranks were still in or attending hospital. 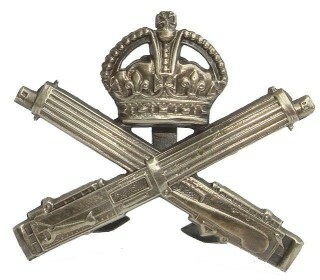 Those who had remained on active service in German East Africa with the Battalion’s Machine Gun Company found that on rejoining the newly redeployed Battalion from Egypt that the Machine Gun Company had become the 259th Company of the Machine Gun Corp. Edgar Raithby was assigned to 259th MGC on the 15th February 1917. There must have been some doubt as to whether he was fit for service as he was admitted to hospital on 16 February 1917 and discharged on 18 February 1917. ‘259 Machine Gun Company was now ordered to embark for Mombasa where it took the train to Nakuru, a town 8,000 feet high in the hills. A recuperation period followed, and then training programmes were completed on Lewis Guns and mortars as the company was issued with both weapons in addition to the machine guns (…) For the last half of the year 259 Company was involved in heavy fighting in the southern part of German East Africa. This culminated in a massive four-day battle at Mahiwa where the company was firing its weapons at close range in thick bush; over 500 German troops were killed but the British suffered similarly and several officers and men of 259 Company were killed and wounded.’ (Fecitt). 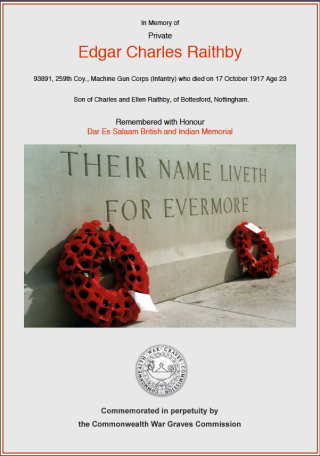 Edgar Raithby was one of those killed at the Battle of Mahawi on the 17th October 1917. He has no known grave and his name is recorded on the Dar Es Salaam British and Indian Memorial.